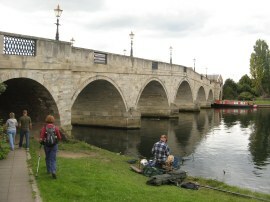 We did this walk on Monday 29th August 2011 and for this stage of the Thames Path Sara and myself were also joined by Val and Chris. 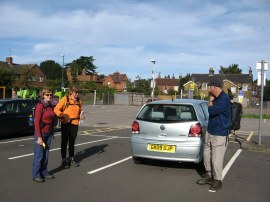 We all met up at Hampton Court Station before heading over to Datchet to resume the walk. Despite it being a bank holiday we had to pay the normal daily rate for parking at the station which cost £5. There is a free car park half a mile or so down Hurst Road however as I will probably be taking the train for the next stage parking at the station avoids a mile or so there and back walking at the start next time around. There was a little bit of sunshine around at the start of the day although this soon disappeared behind quite dark clouds which remained with us for the rest of the walk; it did however stay dry. At Datchet we parked in the station car park, photo 1, which is free on Sundays and Banks Holidays, before walking the short distance down the High Street to rejoin the Thames Path on Windsor Road. 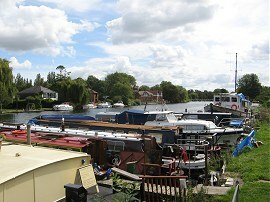 Here we caught a brief glimpse of the river before it disappeared from view behind some riverside houses. We then headed along the road till just past the last house when we were able to join a footpath running along the edge of a field, photo 2. This is followed round the edge of a couple of fields to join a tree lined section of footpath running besides the river which is followed to the Albert Bridge, photo 3. Here we crossed over the river and continued following the towpath downstream towards Ham Island along one of the last remaining rural parts of the path, photo 4. 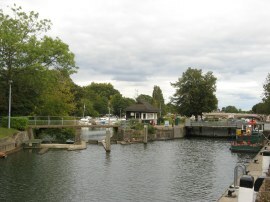 A short distance further on a weir marked the start of the New Cut which is followed down past the waterfront houses on the island to Old Windsor Lock, photo 5. 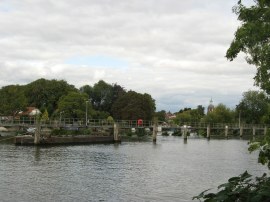 From the lock the path then heads through an area of trees and along a fence lined path running between the river and the houses of Old Windsor. 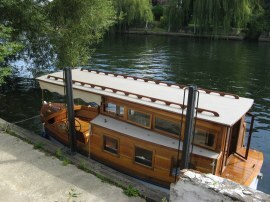 In front of one of the houses was an attractive wooden saloon launch, similar to those built by Peter Freebody and Co, photo 6. Heading out of Old Windsor the towpath heads alongside the A308 Windsor Road for a while as the river curves round to Runnymede, a grassy path running along the edge of the river with Coopers Hill away to the right across the floodplain. 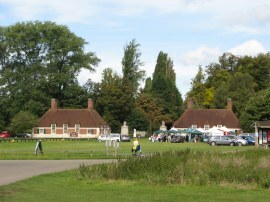 The path passes a couple of lodges that were designed by Sir Edwin Lutyens, photo 7, as part of a memorial in memory of Urban Broughton whose wife gifted much of the surrounding land to the National Trust. 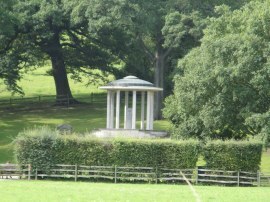 On the hill are a number of memorials which just about can been seen from the river including the Magna Carta Memorial, photo 8, which was built in 1957 by the American Bar Association. Reaching a car park the towpath follows the river away from the road and we stopped for a short snack break on some handy picnic benches before following the river round to another residential area, both with houses lining the riverbank and houses boats, photo 9, on the water. This short straight section of path is followed down past Bellweir lock, where I saw a few Egyptian Geese, and the Runnymede Hotel towards the road bridges carrying the A30 and M25 across the river. 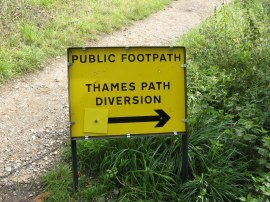 Just before we reached the twin road bridges a sign warned of a diversion to the Thames Path, photo 10. 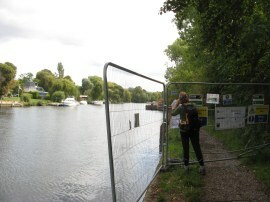 As ever Sara had done her meticulous research so we were already aware of this diversion however after a little bit of debate we thought we would walk down the towpath to the area where it was closed to see if it might be possible to make our way through the area where the works were taking place. Thus we continued down river, under the brick arched A30 bridge and then the more angular structure carrying the M25, photo 11, However reaching the fence off area, photo 12, we decided it would probably be best to retrace our steps and follow the signposted diversion as although it probably would have been possible to climb over the fence we were unsure if we would be able to get out the other side and there could also have been workmen about. Back at the hotel we followed a path that headed through a small area of trees up to the A30 and then turned to the left to cross the road bridge over the river which did at least give us good views back down over Bellweir lock and weir, photo 13. 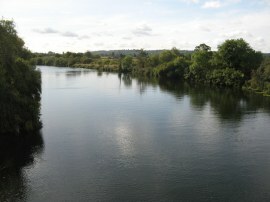 Once over the river the diversion follows a footpath running below the A 30 road which leads to the B376 Wraysbury Road. 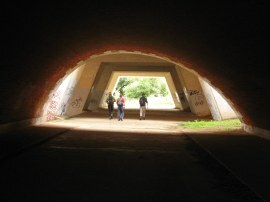 Here we headed to the right, following the road under the M25 towards Staines. The path passes a coal post besides the road before the diversion headed into the grounds of Lammas Park, which incidentally is the start point of the Colne Valley Way. The well way marked diversion headed through the park and along a short stretch of road and by some waterfront houses to reach Staines Bridge, photo 14, where the diversion ended. This had been quite a long diversion around only a very small closed section of path and at the time of writing was due to remain in place until 16th October 2011. 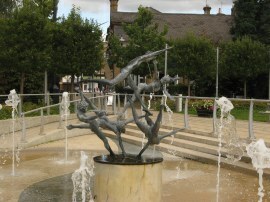 Back on track we followed the river past the centre of Staines, where the waterfront had been landscaped including a number of sculptures, photo 15. From the town centre the path heads along the front of a hotel and by a large brick built church and then under a railway bridge which was lined by a large number of pigeons resting on the ironwork. 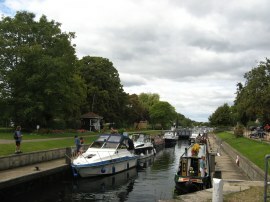 The towpath then heads along surfaced path running between houses and the river, photo16. 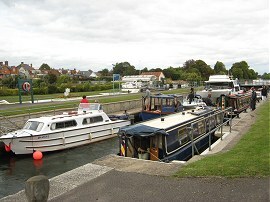 After a mile or so, and after crossing a small grassy area, the route joins a minor road, Thames Side, close to Penton Hook Lock, photo 17. 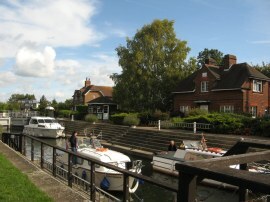 From the lock the route continues along Thames Side, running past the houses of Laleham towards Laleham Park which stretches out alongside the road and waterfront. On the way the path crosses the entrance channel to one of the many reservoirs that are situated in this area, taking waters from the Thames. 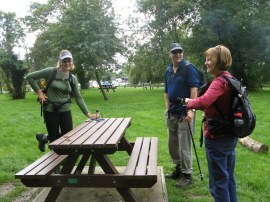 Reaching the start of the park we stopped for our lunch, having walked about 10 miles from Datchet, photo 18. 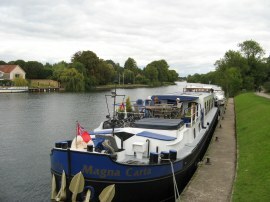 After lunch we resumed our walk, still following Thames Side downstream along the river. 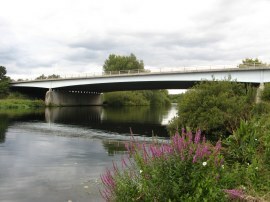 After about a mile we passed under the sleek bridge which carries the M3 motorway over the river, photo 19. 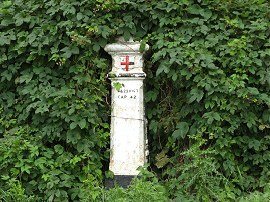 Just below the road bridge we spotted another coal post, photo 20, situated besides the towpath. 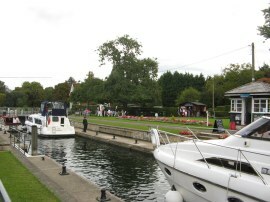 Next up comes Chertsey Lock, photo 21, a short distance further downstream. 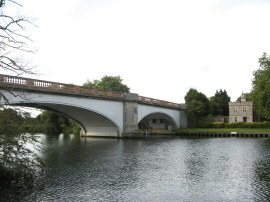 Not much further below the lock the route reaches Chertsey Bridge, photo 22, The bridge is a seven-arch tied arch white stone bridge built 1783-1785 and is a Grade II listed building. Heading under the bridge the path reaches Dumsey Meadow, an area of water meadow which was being grazed cows and more reminiscent of the landscapes we had been walking through nearer the start of the path than the suburban fringes of London we had been walking through for much of the day, photo 23. Leaving the meadow the route continues ahead alongside the river passing a number of houses spaced out along the river bank. 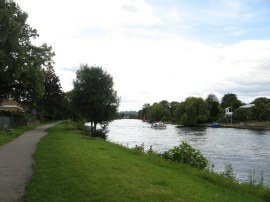 The path then joins another road, marked on Steetmap as Towpath, which is lined with houses on the left and with the river on the right. This is followed as the river heads past Pharaoh's Island which was once given to Admiral Nelson following the Battle of the Nile although now it is residential. 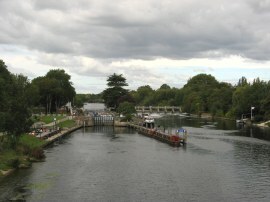 Not far past the end of the island the path heads by Shepperton Weir and a few yards further on Shepperton Lock, photo 24, which if my counting is correct is now the 38th lock we have passed. Not far below the lock the Thames Path reaches Ferry Lane where, unlike most other of the old ferry crossings on the Thames, the ferry is still running and is used by the Thames Path to cross over to the opposite bank. The ferry, photo 26, notionally runs every 15 minutes although when we arrived it had just set off across the river with a couple of passengers on board and soon returned back with a few more from the other bank before setting off once again with us on board, as well as four cyclists, with only a minimal turn around time. Perhaps on a day other than a bank holiday Monday the service may be a bit slower and there is an alternate route to the north of the river for the times the ferry is not running. The fare cost £2 which Sara very kindly paid. 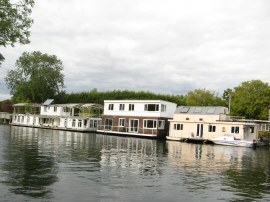 Once over the river the route heads down past D'Oyly Carte Island and along the Desborough Cut. 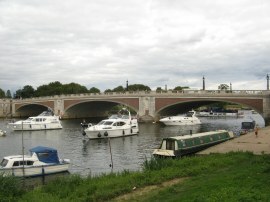 The cut is fairly recent, only having been dug between 1930 and 1935 and takes the river on a straight course between Weybridge and Walton, Its construction created Desborough Island and halved the distance of travel on that part of the river. Leaving the cut the route continues along to Walton Bridge, photo 27. 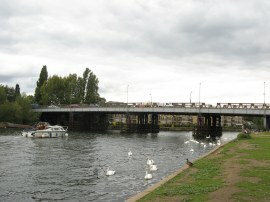 The current bridge is a very new structure having been built in 1999 alongside the previous bridge which is now used by pedestrians and cyclists. There was a tea hut close to the bridge where we stopped for a mug of tea and also some handy public toilets. Below Walton Bridge a decent path heads down past the houses of Walton before heading by a slightly more industrial site and then, just tucked away behind some trees, the Walton Casuals football ground. A few years ago I had walked down this stretch of the Thames Path to watch Maidstone United play Walton Casuals in the final game of the season, a match that Maidstone needed to win in order to win the Ryman 1 South League. 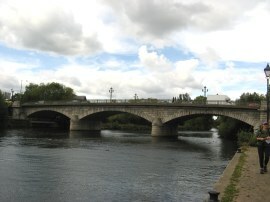 A tense 2-1 victory ensued before we headed over to the riverside Weir Pub and heading past the pub, which is close to Sunbury Weir, photo 29, brought back many happy memories. 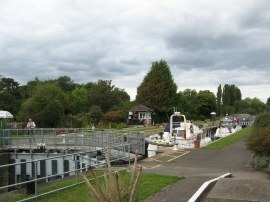 The route then heads down the lock cut, with Sunbury Lock Ait to the left, to reach Sunbury Lock, photo 30, where there are two locks side by side. 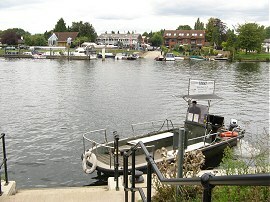 Below the lock, photo 31, the route heads along a rather non-descript section of path running alongside the Molesey Reservoirs although only the embankments of these are visible from the path. Tucked away in the greenery lining the path was a marker stone, photo 32, bearing the inscription 14 & 15 Vic and then underneath C146. 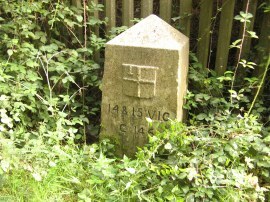 I know that 14 & 15Vic refer to an act of parliament but have been unable to find out what act this relates to although in all likelihood it could be another coal post variant, Eventually the path reaches West Molesey, passing more houses and also a few blocks of flats. 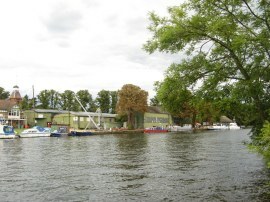 In the middle of the river is Platts Eyot, photo 33, which houses a number of industrial units. 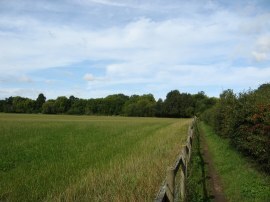 The grassy space besides the river gradually becomes broader as the towpath head down towards East Moseley. 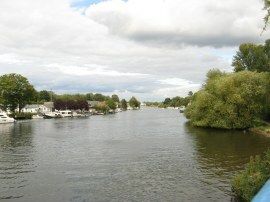 The path passes Garrick's Ait which contains about 20 houses and then Taggs Island. Building is not permitted on this island although it is surrounded by a diverse section of houseboats, photo 34, although the trees lining the river prevented me getting a decent photo of the best of these. 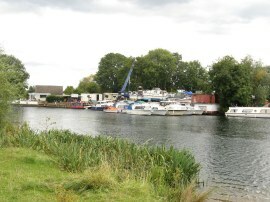 Reaching the end of the island the river bank is once again lined with houses and it is only a few yards further downstream to Molesey Lock, photo 35, which at 268 ft is the second longest on the river, From the lock is only about 100 yards downstream to Hampton Court Bridge, photo 36, which is where we finished this stage of our walk along the Thames Path. 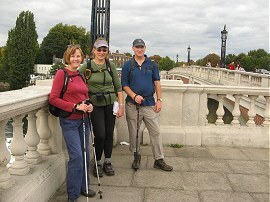 Reaching the bridge, photo 37, we had walked just over 20 miles for the day, although after allowing for our there and back walk along the closed section and subsequent detour only about 18 miles were actually along the Thames Path. This had been another enjoyable walk with good company. We have made the transition from countryside to suburbia now however this actually means that there is a lot more to see than out in the wide open fields further upstream, even if the views are rather less scenic for much of the time. One of the best things about this walk was how much energy I had at the end of the day. When we had walked 21 miles on stage 8 of the Thames Path a few weeks ago I had felt very tired at the end of the walk and had also been very tired around the 20 mile mark when I was walking the Roach Valley Way a couple of weeks ago but this time around I seriously felt like I hadn't walked much more than 10 or 12 miles when we reached the end; something I can never figure out! 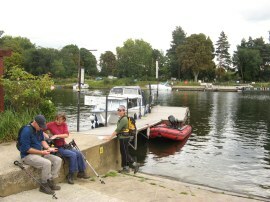 As usual I have uploaded the route of the walk which can be accessed here: Thames Path Stage 10 Route.